Federal Minister for Economic Affairs and Energy Brigitte Zypries is today opening the Start-up Night! Africa at the Federal Ministry for Economic Affairs and Energy. The Start-up Night! 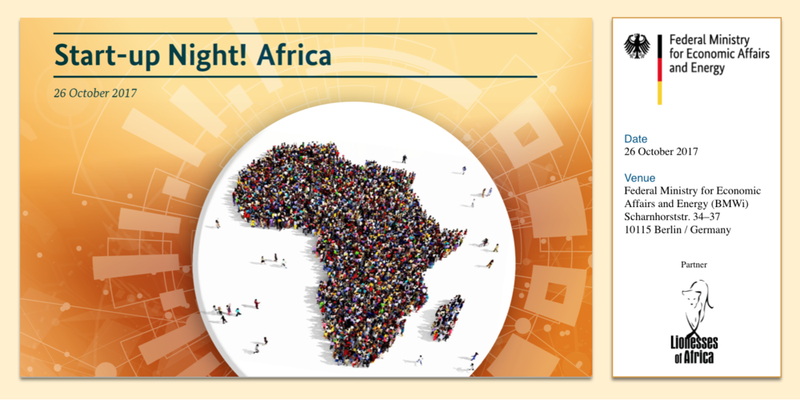 Africa is the latest event to take place as part of the successful series of Start-up Nights!, a string of business-matching events hosted by the Federal Economic Affairs Ministry designed to bring young businesses and established companies together – this time with a focus on Africa. The Start-up Night Africa offers eight entrepreneurs from Africa the opportunity to present creative, digital and marketable solutions that are also of interest to the German market. Start-up entrepreneur Brenda Katwesigye, for example, has developed a mobile App called Wazi Vision that enables children in remote areas to be supplied with glasses – providing eye care in an accessible and affordable way. At the same time, eight German start-ups have the opportunity to present their digital business models in order to reach the African market. The Learning Lions and Start-up Lions, for example, support young people in Africa in training and in starting up a business in the digital field. They bring IT courses to young people directly, providing them with new career prospects and local opportunities in the region. In addition to this, four established companies from Germany will present their cooperation with African start-ups. In an exhibition accompanying the event, other multipliers and companies are providing insights into attractive opportunities for cooperation between German and African businesses. In these ways, the Start-up Night! Events offer start-ups, established companies and multipliers an opportunity to meet with potential partners. Start-up Night! Africa is part of the Pro! Africa initiative run by the Federal Ministry for Economic Affairs and Energy. This initiative aims to mobilise more private capital and investment for Africa and to establish cooperation as equals. The focus is on projects and initiatives in the field of new technology, innovation and digitisation, tailored to local needs and different regions. In order to achieve these aims, Germany’s tried and tested instruments to promote foreign trade and investment will be boosted, our political cooperation will be deepened, and successful funding programmes will also be oriented towards Africa. For more information about the event and on those taking part, please go to: www.de.digital.